U.S. Secretary of State Clinton lashed out at Prime Minister Binyamin Netanyahu, berating him for building plans in northern Jerusalem. United States Secretary of State Hillary Clinton lashed out verbally at Prime Minister Binyamin Netanyahu on Friday, berating him for announcing building plans in Jerusalem during the visit of US Vice President Joe Biden. 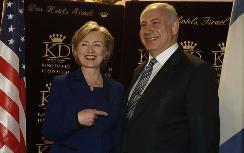 During a 43-minute phone conversation between the two, Clinton told Prime Minister Netanyahu that the announcement, which Israel has said was not intentionally coordinated with the diplomatic visit of Biden, was embarrassing for the United States. She said the incident may imperil a recent joint decision between the Arab League and the United States to reignite talks between Israel and the PA. Under US pressure, Prime Minster Netanyahu issued a 10-month building freeze in Judea and Samaria on November 25, 2009, as part of America's effort to reignite peace talks. During his recent visit, Biden met with the PA leadership in Ramallah and had meetings with Prime Minister Netanyahu regarding the US position and expectations for negotiations brokered between the parties by the US. On March 8, Defense Minister Ehud Barak approved the building of 112 homes in the Judean hareidi-religious community of Beitar Illit. On March 9, Israel's Interior Ministry, under the leadership of Shas MK Eli Yishai, announced plans to develop 1,600 new residences for Jews in the large Ramat Shlomo hareidi-religious neighborhood bordered by the Jerusalem neighborhoods of French Hill, Ramot and Sanhedria, in northeast Jerusalem. In a Friday interview with CNN, Clinton called Israel's building announcement "insulting" to the United States, and reaffirmed the US commitment to the "two-state solution." "I mean, it was just really a very unfortunate and difficult moment for everyone," said Clinton, "and I regret deeply that that occurred and made that known." Following Clinton's phone call diatribe, Prime Minister Netanyahu called the leaders of Italy and Germany to discuss what had happened. He assured them that regulations would be put in place to prevent such an occurrence in the future. American Mideast envoy George Mitchell is expected to arrive in Israel on Tuesday, and will meet with the Prime Minister. However, PA chief negotiator Saeb Erekat said that the PA may not engage even in indirect negotiations with Israel unless the Jewish state reverses its decision to build in Ramat Shlomo.